Before proceeding with this tutorial, let us first understand some key terms which are associated with the testing of any application. Software performance testing is a type of non-functional testing in which the performance of the application is evaluated under expected or higher load. Performance testing is carried out to measure different performance attributes of the system like - response time (speed), reliability, resource usage, scalability, Stability under variety of load conditions etc. 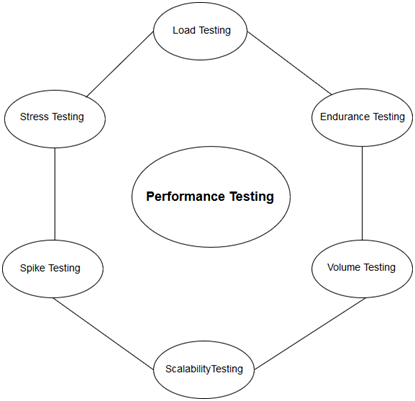 Why do we need Performance Testing? Before launching the final software product in the market, the product should be tested against the speed, scalability and stability under variety of load conditions. If the product goes live without doing performance testing, itmay cause issues like slow processing and poor usability which likely to gain a bad reputation and it affects the expected sales goal directly. Load testing is a type of performance testing that simulates a real-world load on any software, application, or website. It helps to determine how the system behaves under both normal and at peak conditions. Load testing can be performed under controlled lab conditions to compare the capabilities of different systems or to accurately measure the capabilities of a single system. Stress testing is also a type of performance testingwhich helps to determine the ability of a computer, network, program or device to maintain a certain level of effectiveness under unfavourable conditions. Stress testing is also known as Fatigue testing.